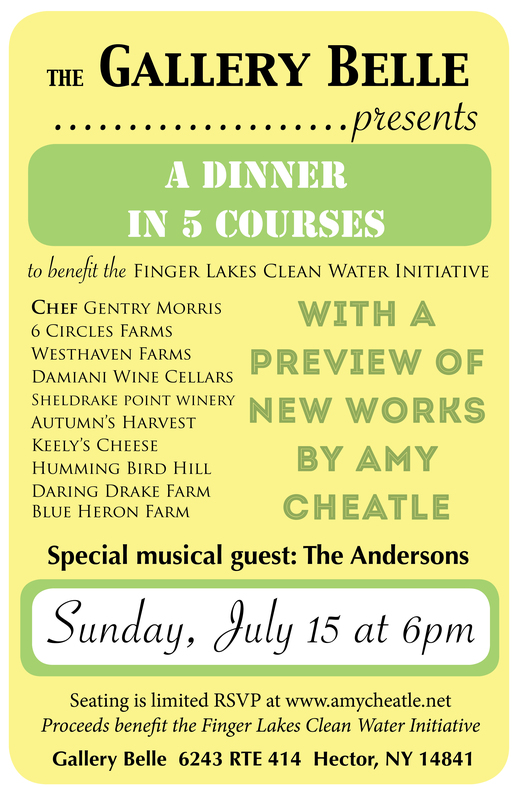 You are cordially invited to join friends at the Gallery Belle Arts Space Sunday, July 15th at 6pm for an evening of local food, wine, art and music to benefit the Finger Lakes Clean Water’s Initiative. Please join us for a five course meal prepared by Chef Gentry Morris using a bounty of locally-sourced foods. Dishes will be paired with local wines, and The Andersons trio will entertain with live music. The large format paintings of Amy Cheatle will hang in the upstairs space. Seating is limited. Proceeds will be donated to the Clean Water Initiative.